Image credit: NASA/CXC/MIT/F.K. Baganoff et al. 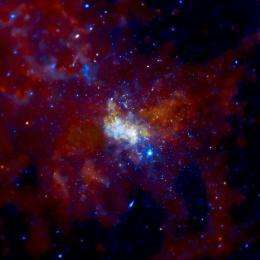 (PhysOrg.com) -- The supermassive black hole at the center of the Milky Way galaxy. The new model of Sgr A* was presented at the 215th meeting of the American Astronomical Society in January 2009 by Roman Shcherbakov and Robert Penna of Harvard University and Frederick K. Baganoff of the Massachusetts Institute of Technology. This article is so full of contradictions as to appear ludicrous. "Young" stars near an old black hole? A black hole holding an entire galaxy together, yet it cannot "eat" the winds from these relatively nearby stars? I remember when "nothing could escape a black hole, not even photons!" And all of these references to 'hot gas'... hasn't anyone ever taken physics courses? What is the *name* of a super-hot gas? What characteristics do they display? Answer that question and you have the answer to your 'x-ray filaments' issue, and the reason why the plasma forms into 'lobes'... or more likely polar jets, and a torus around the middle.